If you are still on the bus when it arrives in Colomba, you have gone about 15 minutes too far. You can get a Golondrina bus, a pick-up or a microbus (minibus) back to the school (it should cost Q5 and take about 20 minutes). The last bus from Colomba back to the school is at 5pm. (If you miss this, please ring the mountain school at 4029-6722!) WE URGE YOU TO LEAVE BY 10am FROM QUETZALTENANGO BUT NO LATER THAN ON THE 2:30 pm BUS TO ENSURE THAT YOU ARRIVE BEFORE DARK AND IN TIME FOR THE INFORMATIONAL TOUR). The school is located less than five minutes down the road from the highway but the road is not lit and is paved with cobblestones – not an easy trek after sunset. It is best to try to arrive for lunch on Sunday as your week with the family runs from noon on Sunday through breakfast the following Sunday. 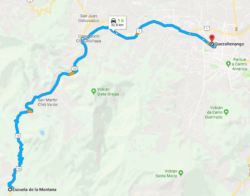 If you get to Xela when it is too late to get to the mountain school, please get word to the office in PLQ by 6 pm or phone either PLQ (502-7765-2140) or La Escuela de la Montaña (502-4029-6722) so we know that you will get to the school the next day and can inform your host family and arrange with your teacher.